Packing up a dew-covered tent and carrying supplies out of the campground (just two trips back and forth this time) made for a rough start for our third morning of Pacific Coast Highway Road Trip Extravaganza 2012. 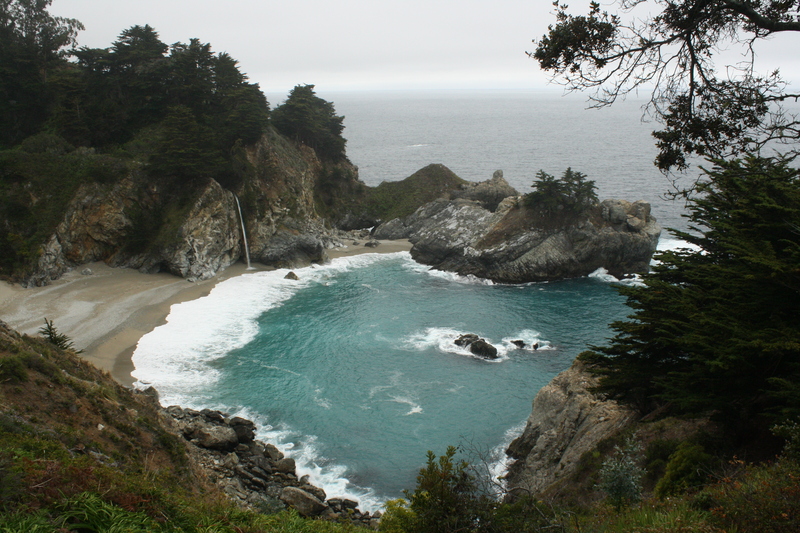 But our spirits picked up considerably when we stopped at Julia Pfeiffer Burns State Park to see the secluded McWay Falls. The lagoon below is filled with bright, blue water, and a waterfall dropping onto the sand. Cliffs prevent anyone from going down to the beach, however. 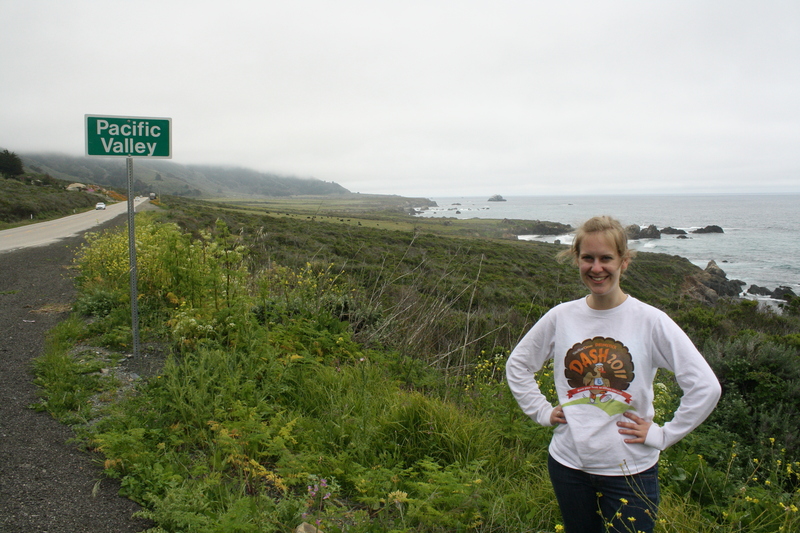 Anyone traveling through Big Sur should stop for the 10-minute walk and gorgeous photo op. 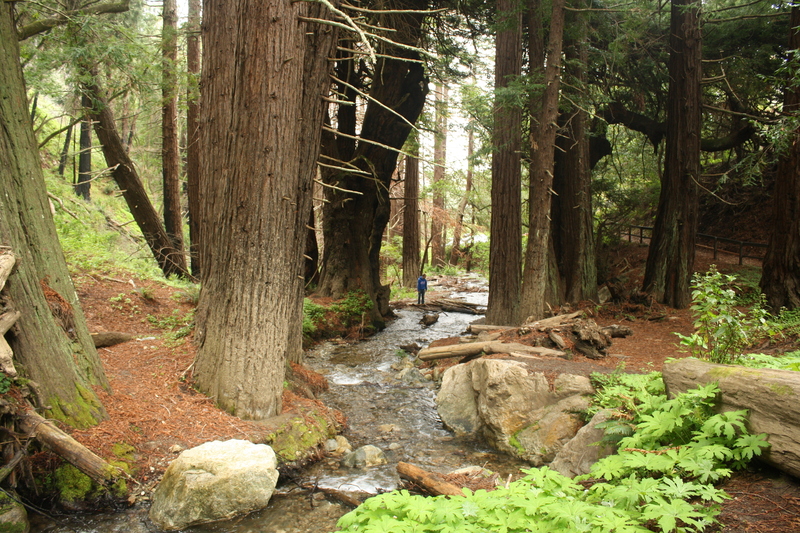 Tom playing in the redwoods grove at Julia Pfeiffer Burns State Park. Big Sur doesn’t disappoint with the number of photo ops available—despite the fog, we made the most of them, taking pictures of the scenery along our drive. Many of my pictures are through the car windows, but we pulled over on quite a few occasions too. I’m sure Tom got tired of me asking him to stop! Tom was tired of me taking spontaneous pictures of him – he thought I should have a turn in front of the camera! Before our trip, I had copied the Central Coast section of pages from a library’s copy of a West Coast road food guide. We did stop at a handful of places—though there were of course many more we had hoped to visit (including a place in Castroville, artichoke capital of the world! But that was too far north). Overall though, we stopped at three bakeries—for olallieberry pie in Cambria, brown butter cookies in Cayucos and the best Danish pastries ever in Solvang (for our last day). 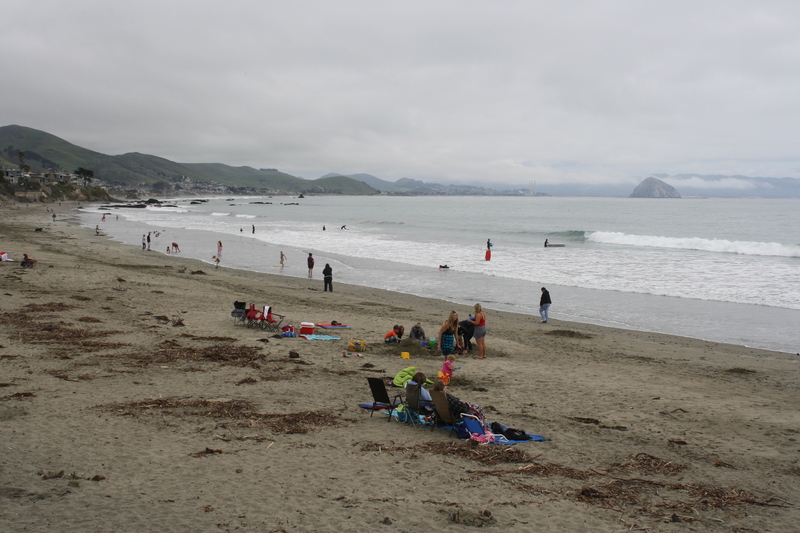 Here’s the beach at Cayucos – and that huge rock out in the bay is Morro Rock. Hence the bay is named Morro Bay. Originally, Day 1 was supposed to have a stop in Santa Barbara and a winery in the area. Of course we ran out of time. But on the way back, we stopped at Rancho Sisquoc Winery about a half hour from Santa Barbara. 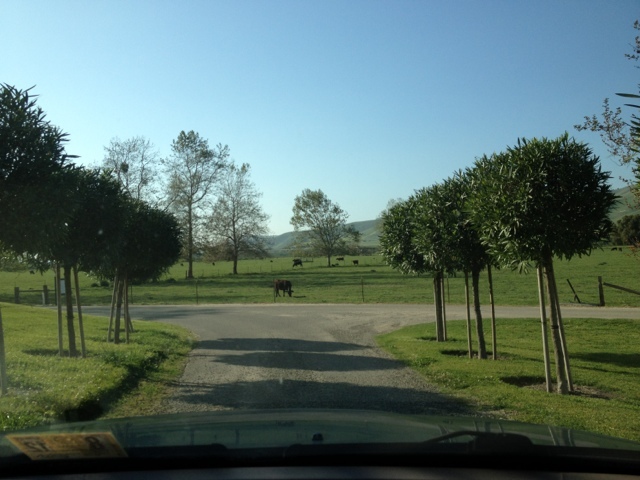 The drive was along remote, flat farmland, with few other cars along the way. Santa Barbara offers a plentiful wine region, though less known than the more northern Sonoma Valley. Rancho Sisquoc is one of the oldest. We passed many little wineries on our drive—I imagine it’d be fun to just map out the area and stop at as many as possible. The women in the small tasting room even gave us a map showing the hundreds of wineries in the area. You’d need a week to visit them all! (Along with plenty of crackers!) Speaking of crackers, the ones at Rancho Sisquoc were delicious—homemade and slightly sweet. We made sure to nibble on quite a few between our six wines. They offer 13 and you get to choose six for tasting. Overwhelmingly, the winery produces reds, which I’m learning to like. All of the ones we tried were delicious, and had we had more time, I would have enjoyed sitting in their picnic area with a glass. The employees also gave us recommendations for dinner for the night. We decided on Hollister Brewing Co. in Santa Barbara, a very small brewery that only offers their beers at their restaurant—no distribution elsewhere. 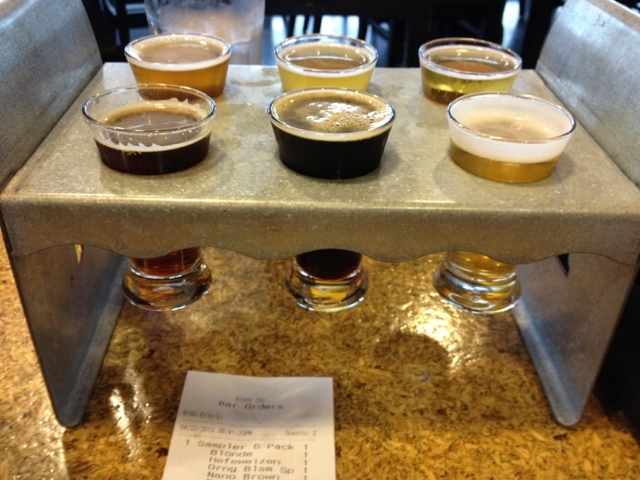 Of course, we each opted for the sampler trays. We had to try as many brews as we could! They were all great, and Tom was disappointed he couldn’t get their Red anywhere else. That night, we had planned to go camping. But being chilly and misty outside, and us being worn out from camping the night before (the ground is never as comfortable as you hope), we ended up finding a nearby hotel. Showers won out over saving money! You should try Term-a-rest air mattresses for your next camping trip. My husband and I use those when we camp and backpack. They easily slim down to pack in a backpack, and surprisingly provide a nice cushion.